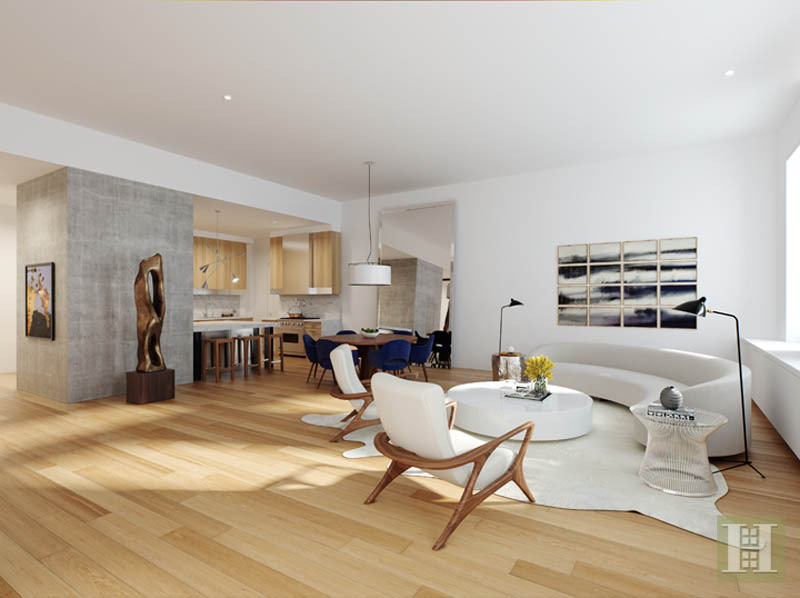 Located in the heart of Tribeca, 15 Hubert represents a moment of intimacy within one of New York's most vibrant and sought-after neighborhoods. 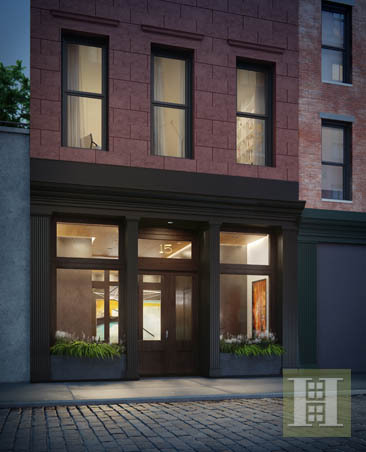 Nestled on a quiet cobblestone street and with just twelve residences, this boutique new development affords residents the luxury of privacy. The inspiration for the design of this loft begins with a commitment to retain the authenticity and openness of the original spaces. The interiors have been ingeniously designed by CetraRuddy Architects to preserve the building's industrial roots while adding a modern perspective and premium finishes. .
To maintain the essence of classic loft living, this residence features an unfettered flow of open space with an expansive great room. Wide-plank solid oak flooring seamlessly unites the kitchen and living areas; and a stretch of white-painted brick divides the public and private areas of the loft. . The fixtures and materials selected for the interiors artfully echo the original aesthetic of the building. 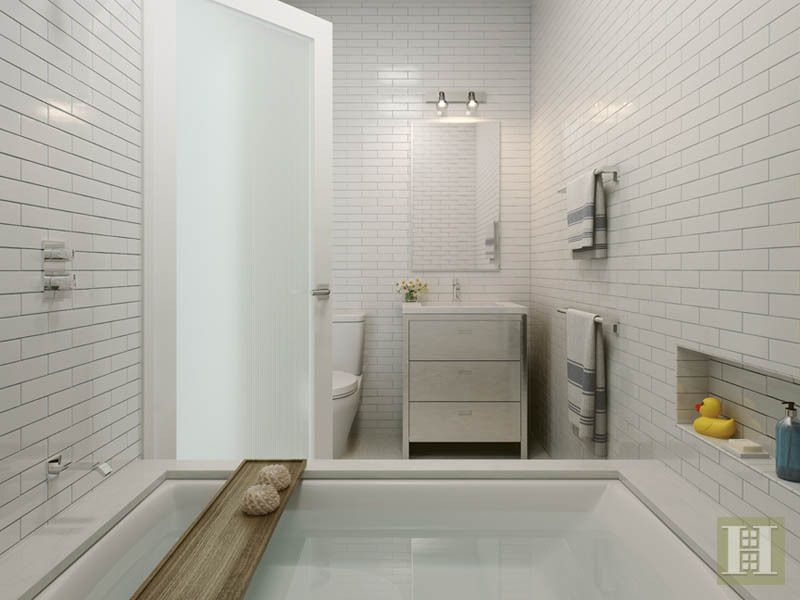 Bedroom and en-suite bathroom doors comprise of a refined, artistic architectural glass with a ribbed surface that reduces glare and obscures the shapes behind it. . 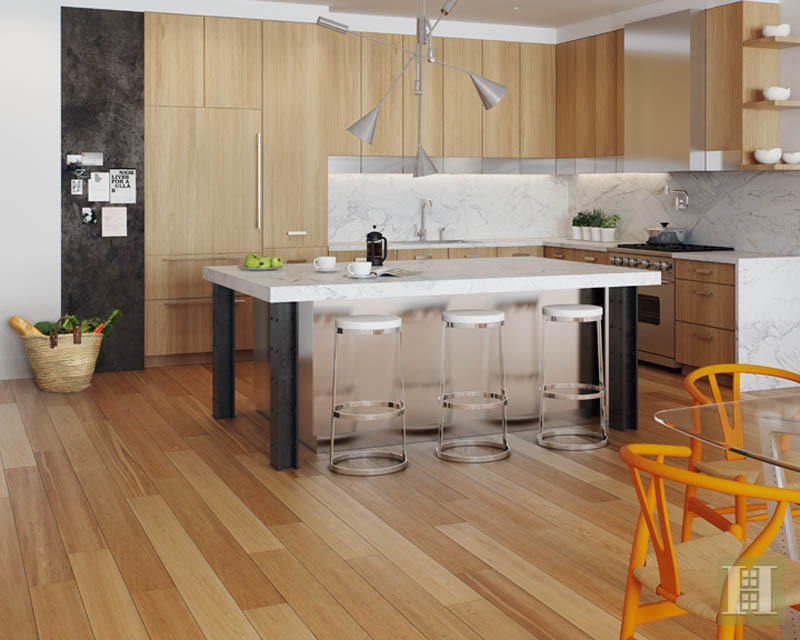 Offset by a monolithic concrete partition, the kitchen features an ingeniously designed magnetic wall produced of rolled steel, and a custom-built Parsons-style table island with riveted, blackened steel legs that harken to the building's manufacturing-era past. Floor-to-ceiling rift-sawn white oak cabinetry, solid-slab marble countertops, and stainless steel appliances form a subtly artistic ensemble. .
A custom-built vanity, a solid-slab Sugar White marble countertop, and dual integrated sinks are accented by a hand-cut marble mosaic accent wall in the master bathroom. 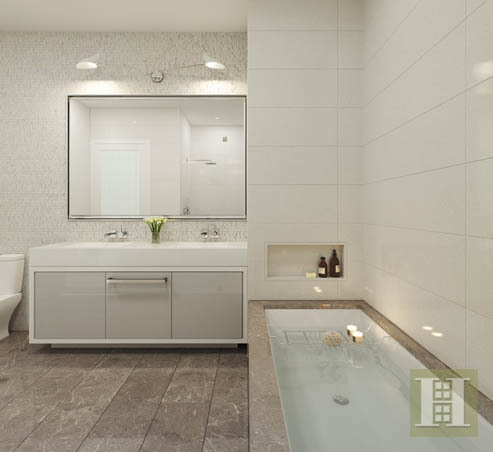 Floor-to-ceiling Thassos White marble walls contrast with Savannah Grey marble flooring and bath surround. . 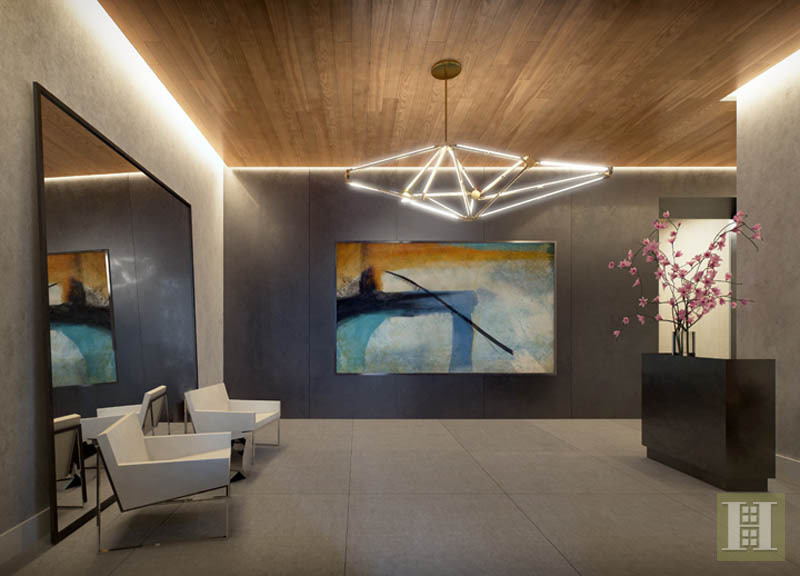 The building's lobby is appointed with concrete paneled walls and wood paneled ceilings, and is attended by a part-time doorman, as well as equipped with a state-of-the-art package reception and retrieval system. 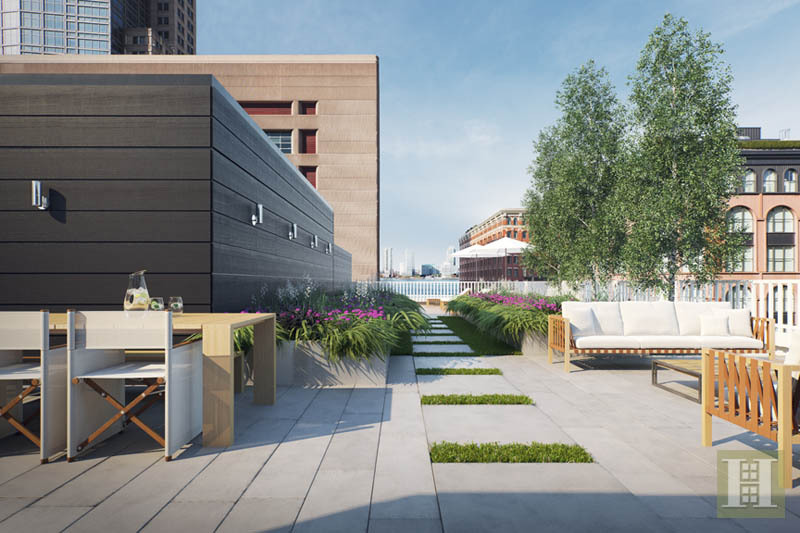 15 Hubert boasts a beautifully designed and landscaped communal rooftop lounge offering glimpses of the Hudson River, just one block west, as well as One World Trade Center.